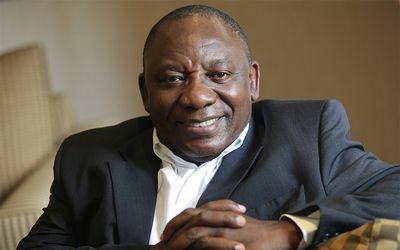 Deputy President of South Africa and the ANC, Cyril Ramaphosa, will go on a hunger strike on May 15 in support of Palestinian prisoners. Ramaphosa, a former chairperson of the Ahmed Kathrada Foundation, has endorsed the #DignityStrikeSA campaign. It calls on South Africans to embark on a 24-hour hunger strike in solidarity with Palestinian prisoners, who have been on hunger strike since April 17. The Deputy President will eat his last meal ahead of the solidarity hunger strike before 6pm on May 14. He will only be allowed to have salt water, which is what Palestinian prisoners have been surviving on for last 26 days, before ending the hunger strike at 6pm on May 15. May 15 was symbolically selected for the #DignityStrikeSA campaign to mark the Nakba (Catastrophe) that saw Palestinians being forced to flee their homeland in 1948, and the establishment of Israeli occupation. Ramaphosa will be joined in the hunger strike by a range of other public representatives. They include: Dr Aaron Motsoaledi (Minister of Health), Ayanda Dlodlo (Minister of Communications), Naledi Pandor (Minister of Science & Technology), Rob Davies (Minister of Trade & Industry), Ebrahim Patel (Minister for Economic Development), Mmamoloko Kubayi (Minister of Energy), Nomaindia Mfeketo (Deputy Minister of International Relations and Cooperation), Buti Manamela (Deputy Minister in the Presidency), Enver Surty (Deputy Minister of Basic Education), Stella Ndabeni-Abrahams (Deputy Minister of Telecommunications and Postal Services), Fatima Chohan (Deputy Minister of Home Affairs), John Jeffery (Deputy Minister of Justice and Constitutional Development) and Bongani Mkgoni (Deputy Minister of Police). Well known personalities, liberation icons, activists and political leaders who have also pledged to participate include: Ebrahim Ebrahim (79 year old former Robben Island prisoner and Advisor to the President), Dr Nkosazana Dlamini-Zuma (Former African Union Chairperson), Gwede Mantashe (ANC Secretary General), Jessie Duarte (ANC Deputy Secretary-General), Faiez Jacobs (ANC Provincial Secretary), Laloo Chiba (86 year old former Robben Island prisoner), Kehla Shubane (former Robben Island prisoner), Derek Hanekom (Ahmed Kathrada Foundation Chairperson), Trish Hanekom (former anti-apartheid detainee), Sidumo Dlamini (President of the Congress of South African Trade Unions), Mluleki Dlelanga (YCL National Secretary), Khulekani Skosana (Secretary-General of the Congress of South African Students), Sifiso Mtsweni (NYDA Chairperson), Reverend Edwin Arrison (Chairperson of the National Coalition 4 Palestine), Frans Baleni (Deputy Chair of the Development Bank of Southern Africa and former NUM GS), Allan Kolski Horwitz (SA Jews for a Free Palestine), Charles Setsubi (SACP CC member) Bongani Mbindwane (former anti-apartheid detainee), Parks Tau (President of the United Cities and Local Government, Chairperson of SA Local Government Association and former Mayor of Johannesburg) and Mpho Masemola (Chairperson of the Ex Political Prisoners Association of South Africa). TV and radio presenters Eben Jansen, Hajra Omarjee, Nina Hastie, Kuli Roberts, Shaka Sisulu and media personalities Kay Sexwale, Janet Smith, Jimi Matthews and Yusuf Abramjee have also lent their support to the 24-hour hunger strike. Kwara Kekana from BDS South Africa urged South Africans to continue pledging their support for the solidarity hunger strike by emailing their names and details to palestinianpoliticalprisoners@gmail.com . “We have been receiving tremendous support from a range of individuals, as can be seen from the growing list of ministers, deputy ministers and others. We’re encouraging ordinary South Africans to also make their pledges of support public by emailing us their names and bios, and sharing photos of themselves on social media with the words” ‘I support #DignityStrikeSA,’” Kekana said. The solidarity hunger strike will be accompanied by pickets at provincial legislatures in various cities across the country on May 15 between 12pm and 2pm. It will culminate with a solidarity rally at Constitutional Hill at 6pm. Details of these activities will be made publicly available this weekend. The Palestinian hunger strike is being supported in South Africa by organisations including the: ANC, Ahmed Kathrada Foundation, Embassy of the State of Palestine, Al Jama-ah Political Party, Amnesty International (Wits), Cosatu, SACP, UDM, Economic Freedom Fighters, Equal Education, Ex Political Prisoners Association of South Africa, Gandhi Remembrance Organisation, Institute of Palestine South Africa, Kairos Palestine Study Group – South Africa, Palestine Solidarity Alliance, KZN Palestine Solidarity Forum, Palestine Museum, Palestinian Solidarity Campaign, PMB4Palestine Action Group, #TheWalkZone Radio Talkshow, UCT Palestine Solidarity Forum, UKZN Theology and Development, UP Palestine Solidarity, Wits PSC, BDS South Africa, MSA, MJC, Nehawu, Palestine Solidarity Committee, Al Quds Foundation, South African Jews for a Free Palestine, Samwu, Johannesburg Against Injustice, South African Prison Organisation and the National Coalition 4 Palestine (which includes more than 40 Palestine solidarity organisations, human rights groups, trade unions and political parties). Previous Happy Birthday Zeus Bagwandeen!